For those that don't know, the Washington, DC metro region is nestled into a pocket of our country that offers a huge variety of places to explore. A short drive east takes you to the ocean, while a trip up north to the big cities of the northeastern corridor. Heading west you run into the mountains, and a short drive south has you into the heart of...well...The South. 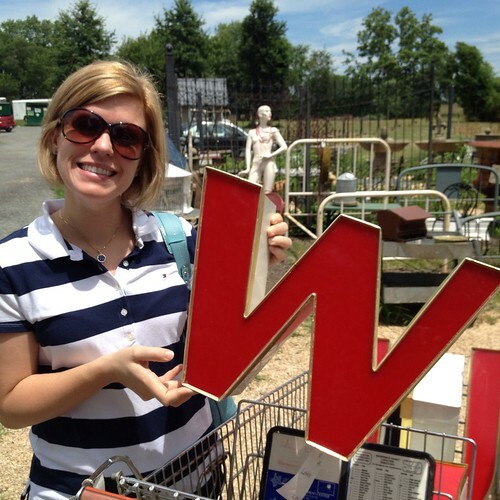 The really cool thing about any of the directions you can head out of DC is that you will be hard pressed not to find a cool town with lots of interesting and great finds for the home. Approximately 40 miles west from Old Town Alexandria is a small town called Lucketts, Virginia, right by Leesburg, Virginia. Nestled in horse country, and amidst suburban sprawl and a few local wineries, sits an ideal location for finding buried treasure. Within a several mile radius are several interesting old homes that have been converted into antiques stores, boutiques, and great places for salvage and vintage finds. 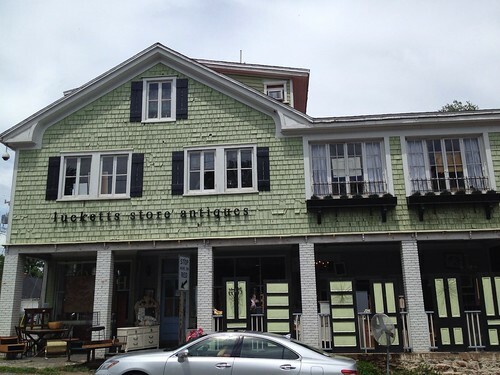 Of these establishments, by far my favorite is the Lucketts Store. 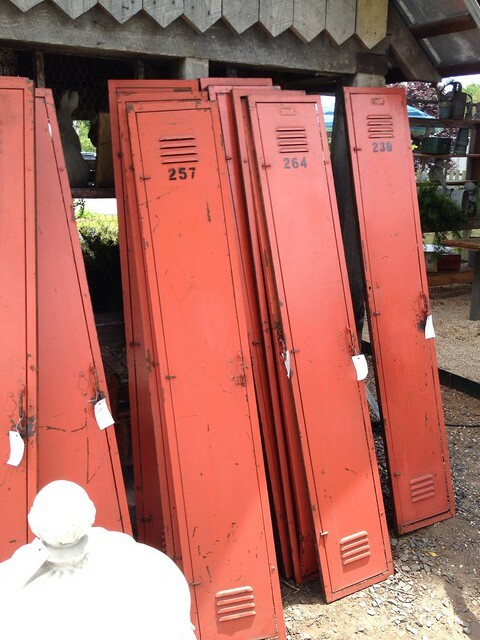 You never know what you might find, but this past weekend as we set off for an afternoon of antique shopping, in the back of my mind I was keeping an eye out specifically for a mirror for our master bathroom, a pair of chairs for the sun porch, or other unique accessories. I've had great luck there in the past, and was excited about what I might find this time. The grounds are situated with a few houses with antiques inside and on the porches, and a large parking area with outdoor vendor setups. Right off the bat, we set out to exploring the vendors' tents alongside the parking lot. 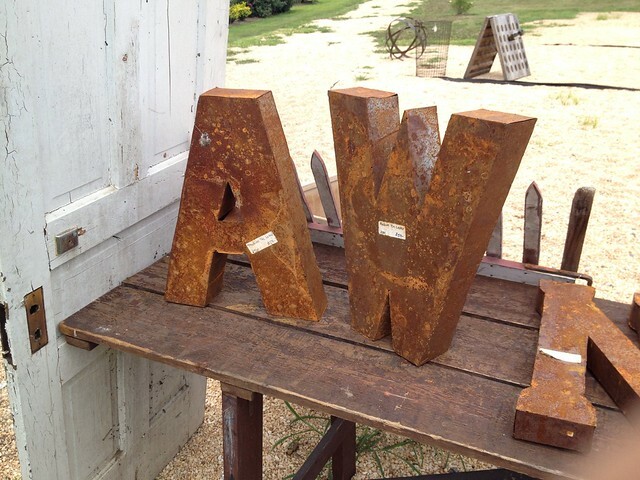 We weren't 30 seconds in when these rusty tin letters caught our eye. And what luck -- they had our initials! 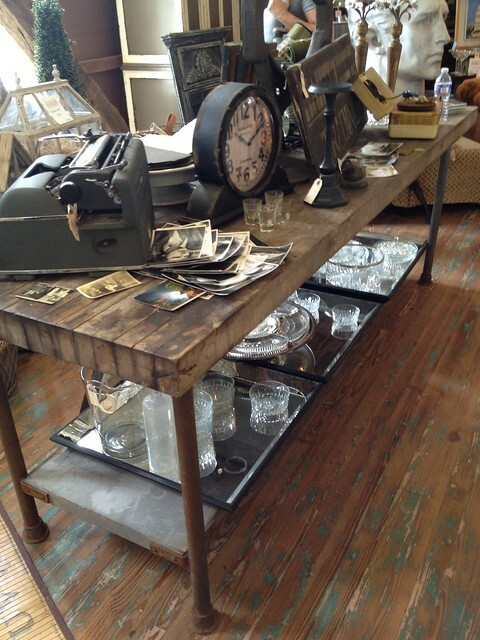 There were so many cool industrial feeling pieces that would look great in the right kitchen. Just look at these lights. Leaving them painted or taking them back down to the bare metal, they might look awesome above an island or over a counter without overhead cabinets. 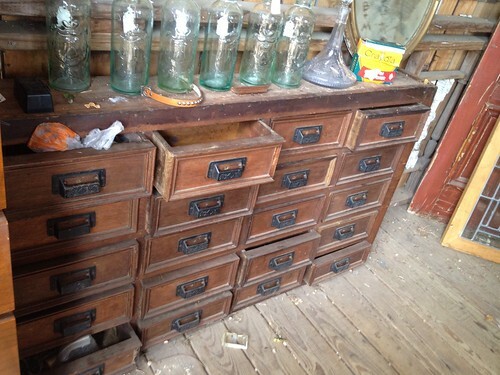 This great apothocary-ish bank of drawers was full of sewing and crafting supplies. If I had a design studio this might be the perfect thing to place back in the corner to hold any and all of my small inspirational items. But in a home with a large entry hall, this would be a great table for dropping your keys, or anything else. ...And several smaller ones more appropriate for a house a similar size to our own. If only he had unlimited time. Whenever I see unique colored pedestal sinks or toilets, like this large aqua sink, I sort of love them...a lot. It probably wouldn't work with our house or with my typical design aesthetic, but wow, how cool? I like to think about the bathroom it may have come from, and the life something like this once lived. Where had it been? When had it been? Who loved this fun shade of greenish blue so much that they decided to put it throughout their bathroom? And what else in the bathroom was the same color? So many questions. These locker fronts were leaned up against another outdoor tent, and Alex was immediately drawn to them. 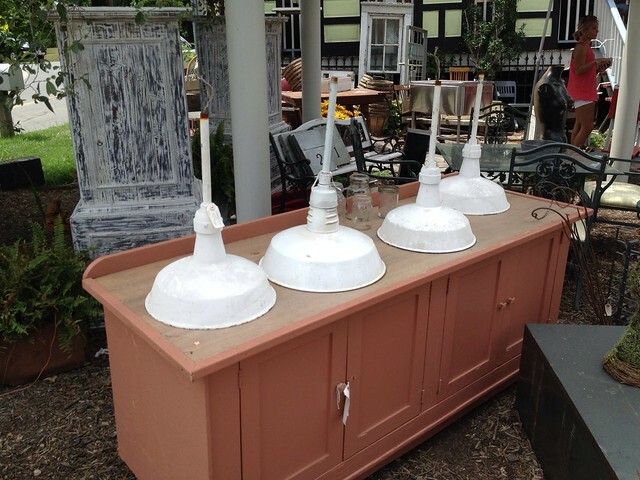 Though their color and patina are great as is, Alex wanted use them in a cool garage, basement, or mud room configuration but painted with a high gloss enamel. These could have been a pretty amazing addition of we wanted to carry our "School House" theme into the basement from the basement stairs makeover we did last winter. 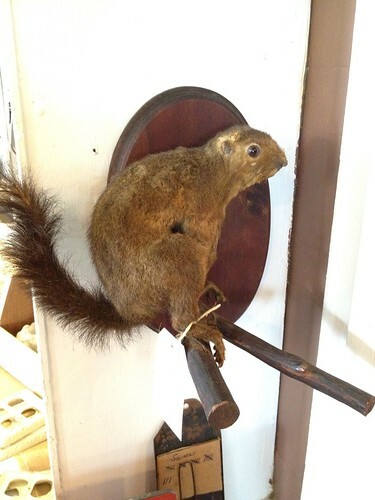 ...and a taxidermied black squirrel that could be her new best friend. She has such a tenuous relationship with the squirrels in our yard, I really think this would help ease the whole situation. I'm not sure how, but it should. 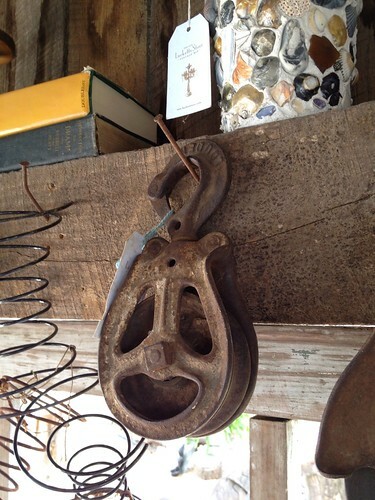 Alex has been looking for a few good industrial style pulleys for a project he's been mulling over. Though this look is exactly what he wants, the size is a bit too big, and they only had larger ones, not smaller. On the other hand, I've been slowly amassing a collection of eclectic mix of old bottles for our master bathroom. In this case, I think I found the mother load. Just look at all of these little beauties. My absolute favorite piece of the day was much too large to take home, but a girl can dream. This huge table with an industrial feeling metal base, and thick and aged butcher's block too, was just the coolest thing of the whole trip. 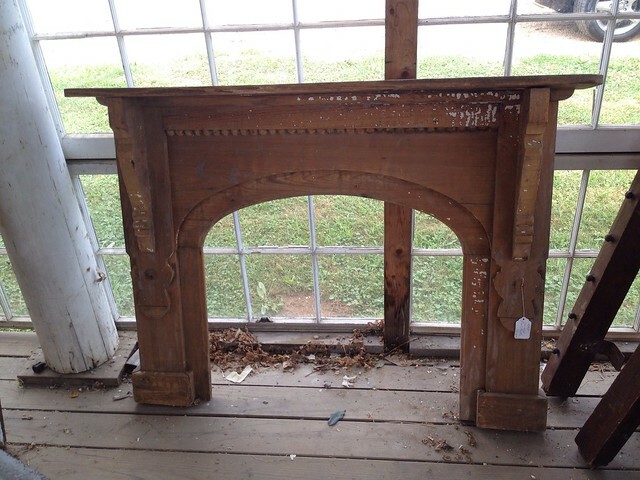 I think it would be perfect for a large kitchen that needed a free standing island, and it would instantly add so much character to any room you place it in. I sadly left it were it stood, but oh the possibilities. All in all, we had a blast admiring, commenting, and rummaging. But between the nearly 100 degree heat and our modest 15' wide home, we didn't see anything we couldn't go home without. No matter our lack of purchases, we still had plenty of great finds that are now just waiting for you. 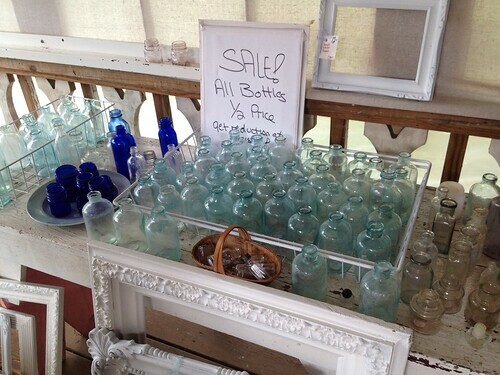 If you're in the DC area and are looking for a place to find some great items at reasonable prices, you should head on out to Lucketts, Virginia. It's well worth the trip, even if you don't bring anything home. Did you do any treasure hunting this weekend? 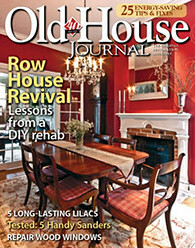 Or do you have some "go to" places for antiques and unique items in your neck of the woods you wouldn't mind sharing? We're always up for a good shopping adventure. We have the teeny tiniest pulley I've ever seen in our basement - it's like the size of a quarter! No idea what it's purpose was. My brother and his wife recently bought and remodeled their 1950's? ranch house. The kitchen had a turquoise sink that was a bit darker in color than the one you found. I loved it! They replaced it with a new stainless steel sink, but I think it would have looked really cool if it had been left as is. I LOVE places like that. It'd be a fun place to stop on a road trip if I ever head down that way. You definitely should stop in Carrie. Judging from your aesthetic, I think it would be right up your alley. I wish we had something like that here. :-( So much fun stuff in one place. It's absolutely worth the hour long drive for us. It's a super cool place! There was a tub that matched that sink a couple of weekends ago at Community Forklift. 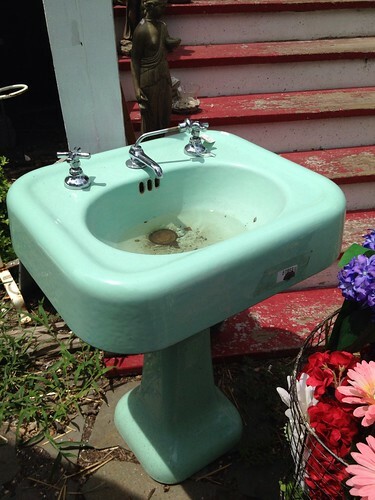 Many folks associate those wild colored plumbing fixtures with the 1950s, but they were introduced in the late 1920s as the Art Deco era was ushered in. This one looks like one of the earlier ones. Last weekend was the first weekend we were able to go out "hunting" for a while. We ended up finding a nice, original mahogany Chippendale style chest of drawers at a local thrift store. The brasses weren't original, but the piece was put together using a mix of rosehead and very early cut square nails and all joints were made by hand, complete with appropriate tool marks. From this, we'd estimate it dates to about the early to mid 1790s. Not a bad find for $35! We also picked up an original Sheraton-to-Empire transitional mirror (probably 1820-1825) for our guest room at another of our frequent haunts. Getting out there and picking is fun! I just wish we had the time to do it more often! Man, that sounds like a really awesome find. 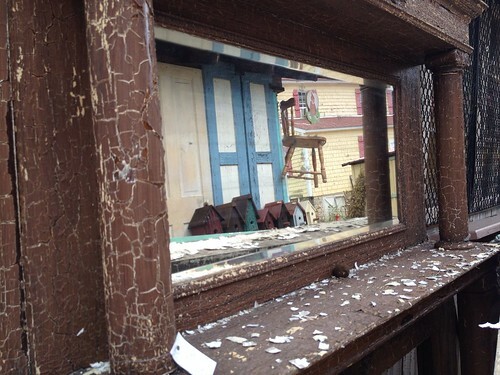 Congrats on that one, I know how great it feels to come home a winner in the antique lottery. I love Luckette, and like you I come away from it without buying anything, only dreams of "if I had a house then that and that could go in it..." The Lulu soap are funny as heck. I think we treat trips to places like this as a real life version of Pinterest more than anything. 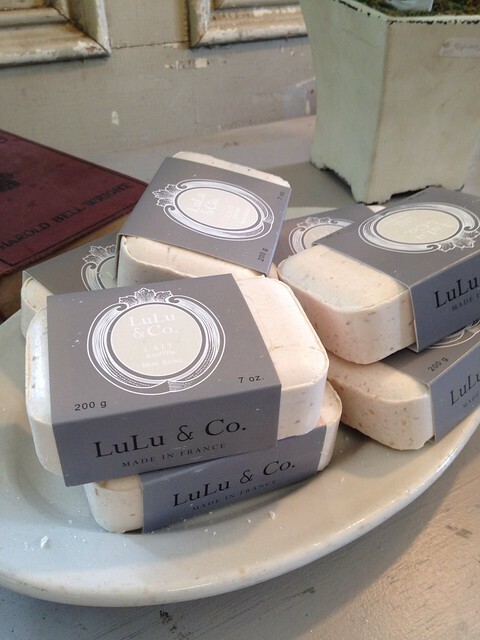 We're still thinking we should have actually bought Lulu her own soap.